Library image #2006: Steller sea lions and northern fur seals, Bogoslof Island, westside, 1973. The United States Congress designated the Bogoslof Wilderness (map) in 1970 and it now has a total of 175 acres. All of this wilderness is located in Alaska and is managed by the Fish and Wildlife Service. Russians believed that they heard the "voice of God" (bogoslof) as a fiery eruption lifted Bogoslof Island from the cold Bering Sea around 1796. 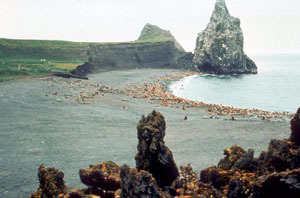 Bogoslof and little Fire Island were first designated as Wilderness and later added as a subunit of the Aleutian Islands Unit of the Alaska Maritime National Wildlife Refuge. An active volcanic island, Bogoslof has undergone change as recently as 1993. A single rugged spire, Castle Rock, stands above the island's rocky beaches and black lava and rises over 100 feet above sea level. Vegetation on this domed and treeless isle is typical of the Aleutians: grasses, sedges, heath. As many as 90,000 murres, kittiwakes, puffins, and gulls nest here. A rookery of fur seals has grown in size, while a sea lion rookery that peaked with about 5,000 individuals has shrunk. North of Unalaska Island, Bogoslof is difficult to access and rarely seen except over the gunwales of passing fishing boats. Winds blow almost constantly during cool foggy summers and mild foggy winters. Although the Bering Sea does not freeze here, storms come often and remain long, violently hurling wind and waves against the barren shoreline. The Wilderness receives 73.5 inches of precipitation each year. Summer temperatures average in the low 50s and 60s (Fahrenheit) and in the low 20s and 30s in winter. The few boats that do arrive find no anchorages, coming only at risk and with special permission of the refuge manager for scientific or educational purposes. Planning to Visit the Bogoslof Wilderness? How to follow the seven standard Leave No Trace principles differs in different parts of the country (desert vs. Rocky Mountains). Click on any of the principles listed below to learn more about how they apply in the Bogoslof Wilderness.